There is nothing that equals the seductive, vanilla-laced scent of a fresh-baked waffle cone. Better still is a hand-made waffle cone shaped like a taco wide enough to accommodate not one, but two scoops of your favorite dairy and dairy-free Halo Top Creamery ice cream flavors that, up until now, have only been available in handy eat-right-out-of pints at your local grocery. But now, Halo Top Creamery, is launching its second-ever Halo Top Scoop Shop with it’s grand opening at Westfield Century City on Tuesday, April 24, 2018, where you will be able to experience Halo Top’s exclusive soft serve, sundaes, rainbow tacos, and more. A quick flip and form, and the crisp, colorful rainbow waffle Taco shell is ready to fill with dozens of flavor choices like dairy-free Caramel Macchiato, Chocolate-Covered Banana, Cinnamon Roll, Sea Salt Caramel, Birthday Cake, or Pancakes and Waffles, or the dairy counterparts or other flavors like Vanilla Maple, Lemon Cake, Chocolate Chip Cookie Dough, Chocolate Almond Crunch, Red Velvet, Mochi Green Tea, Or Blueberry Crumble, just to name a few. 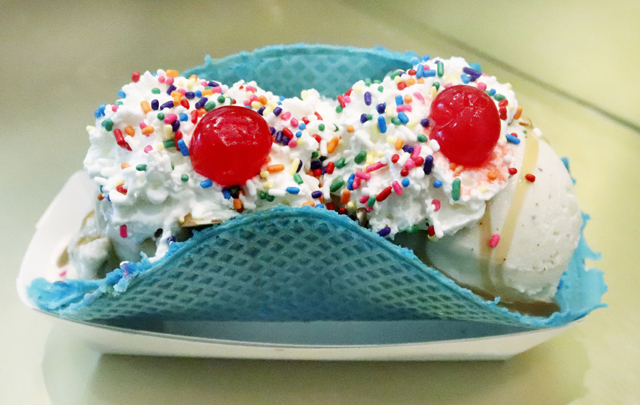 Available toppings line up to round out your perfect Taco, or custom Sugar, Waffle, or Puffle cones or cup—from the traditional nuts, cherries and sprinkles, to crumbled cookie, crushed candy bar and gooey gummy bears. Halo Top ice cream is touted as higher in protein and lower fat and sugars per half-cup serving as compared to other ice cream brands, with comparisons making Halo Top anywhere from 40 to 250 percent lower in calories, 50 to 750 percent lower in fat, and 116 to 233 percent lower in sugar. Halo Top uses “organic stevia” as a sugar replacement to sweeten the ice cream, and Erythritol, a sugar alcohol “found in fruits like pears and grapes, but doesn’t affect blood glucose or cause bloating” according to the website. That’s a bit of math and science that might make your Taco Tuesday a little more sweet, and a bit more guilt-free. The Halo Top Scoop Shop grand opening on Tuesday is located at 10250 Santa Monica Blvd., 90067, on the second level of the Westfield Century City, next to CPK. 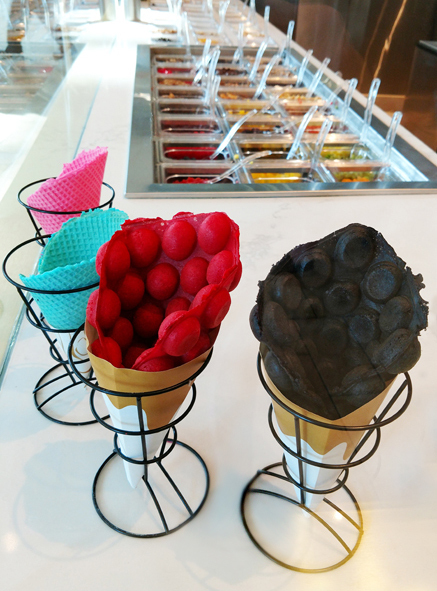 This entry was posted in Food, Miscellanious and tagged Halo Top Creamery, Halo Top Scoop Shop, ice cream, mochi green tea, puffle cones, red velvet, sea salt caramel, taco tuesday, waffle cones, Westfield Century City. Bookmark the permalink.